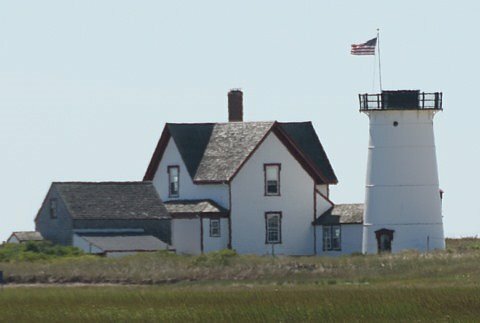 A 48-foot cast-iron tower and wood-frame keeper's house were built in the area of Chatham known as Stage Harbor at a cost of $9,862.74, and the light went into service on July 15, 1880. The lighthouse was fitted with a fifth-order Fresnel lens that exhibited a fixed white light visible for 12 nautical miles. In 1933 an automated light on a skeleton tower replaced Stage Harbor Light. The government removed the lantern and capped the tower, and the property passed into private hands. The same family that first bought the property, the Hoyts, still owns it. There has never been electricity at the station, and no plumbing except a single pump. A skeleton tower continues as an active aid to navigation, exhibiting a white flash. The lighthouse can be viewed across the water from the town landing at the end of Sears Road, or can be reached after a one-mile hike on Harding's Beach. The house and tower are private property. Take Route 28 into Chatham. At the small rotary/circle/roundabout in Chatham turn south onto Stage Harbor Road. In 1.2 miles Stage Harbor Road becomes Champlain Road. Continue straight on Champlain Road for 0.6 miles to a 4-way intersection. Continue straight onto Sears Rd.